A recap of last night's Toronto/ Florida game. 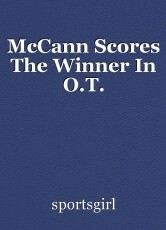 Jared McCann scored the winner in overtime. The Florida Panthers are hot. Last night against the Toronto Maple Leafs, Florida went ahead 2-0 quickly. Aleksander Barkov scored the lone goal of the first period at 11:02.
just 1:42 into the second period, Jonathan Huberdeau put the Panthers ahead by two goals. Toronto tied the game before the second period was over with goals by Dominic Moore and Zach Hyman. There was no scoring in the third period, however, Toronto out shot Florida 15-12. 3:47 into overtime, Jared McCann scored the winner and Florida walked away with the 3-2 victory. Florida's Vincent Trocheck had two assists. Panther's goalie, Roberto Luongo, stopped 37 shots last night. Toronto doesn't play again until Saturday night. The Leafs travel to Washington to face the Capitals.